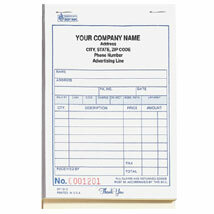 Custom Sales Forms come in three different sizes and styles. Price includes 5 lines of custom information- your store name, address, phone # and advertising line. Forms are sequentially numbered; choose a 6 digit starting number or first book will automatically start with 001001. Specify imprint color: Red, Blue or Black. 50 sales forms per sets/book.